Explore New Zealand's North Island with its unique 7 unique geographical regions and diverse natural beauty, from soaring mountain peaks, fiords, lakes, rivers, native rugged bush, the majestic volcanoes of the North Island's central plateau to the central North Island skifields of Whakapapa and Turoa by bus and coach from Taupo (Lake Taupo). Taupo (Pop: 23,400) is located on the shore of Lake Taupo in the centre of the North Island of New Zealand, on the northern edge of the volcanic plateau, 280kms southwest of Taupo, 82kms southwest of Rotorua and 380kms north of Wellington and is renown for its trout fishing mecca. Lake Taupo, an extinct volcano that last erupted in AD186. Lake Taupo is 616 square kilometres. New Zealand's longest river - the Waikato River forms the outflow from the Lake that flows from east to west. The rivers that flow and out of Lake Taupo are full of trout. 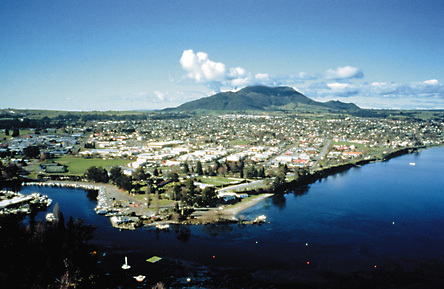 Taupo is a major junction for travelling south of Taupo to Wellington and north to Rotorua, Hamilton and Auckland or east to Napier and Hastings. Taupo is a tourist centre, particularly in the summer, as it offers panoramic views over the lake and to the volcanic mountains of Tongariro National Park to the south. Taupo services a number of surrounding plantation pine forests including Kaingaroa Forest, the largest manmade forest in the world, and related industry. A large sawmill is sited approximated 3 km to the north east of the town on Centennial Drive. The Wairakei geothermal power station is a few kilometres north of the town. There is a wide range of activities to do in Taupo ranging from visiting wineries, white water rafting, jet boating, visiting the world famous Huka Falls, Wairakei geo thermal, mountain biking, to name a few of the many activities that are available. The Taupo region has its own thermal area and can be used as a ski base for the Whakakapapa and Turoa Skifields on the slopes of Mt Ruapehu. Travelling from Taupo is in modern buses and coaches with InterCity Coachlines operating a fleet of eco-friendly air conditioned buses with reclining seats and foot rests. Great Sights and Newmans Coachlines operate premier services using a fleet of modern eco-friendly air conditioned coaches featuring reclining seats with foot and head rests and onboard toilet/washroom facilities. InterCity Coachlines Starlighter overnight bus service operating between Taupo, Auckland, Hamilton, Rotorua, Palmerston North and Wellington connects at Wellington with the Cook Strait ferry services operating between Wellington in the North Island to Picton in the South Island. The Starlighter overnight service features reclining seats with foot and head rests, individual reading lights and air conditioning controls, onboard toilet/washroom facility and makes two refreshment/comfort stops on route. If you want to explore and see New Zealand's unique scenic beauty from Taupo, there are a range of flexible 'Book As You Go' bus, scenic coach, ferry travel and sightseeing passes giving you value for money travel. Your 'Book As You Go' flexible bus, scenic coach and ferry pass, allows you to travel through out New Zealand on New Zealand's largest regional and national bus, coach, scenic coach, ferry and sightseeing network, that includes Cook Strait ferry sailings between the North and South Islands, sightseeing tours - like dolphin watching cruises in the Bay of Islands and lots more. Travel is discounted, so you will be saving money, as you travel plus it gives you total freedom to alter your plans whenever you want. Set your own itinerary and travel when you want, as your 'Book As You Go' flexible bus, scenic coach and ferry pass is valid for 12 months so you can stay a while and leave when you please.